2008 Argyle Brut: Retail ~$22-25. Simply put, this is our go-to sparkling wine. It is bright, refreshing, relatively inexpensive and just fun. Gobs of granny smith apple this time around (reminiscent of the 2006) and brilliant acidity. On the porch, patio, at a picnic or party, this wine can handle all with aplomb. Very Good. 88-90 Points. 2005 Argyle Pinot Noir Spirithouse Reserve Series: Retail ~$70. I am a fan of Argyle. I would even say that I am a big fan of Argyle. Right now I have 55 bottles in the cellar and Cellar Tracker tells me I have bought more than 20 cases of their wine over the years (most of that was the Brut and a good bit of it I bought for friends, but still…). I hold on to these single vineyard Pinots for a while to give them a little more age. That might have been a mistake here. While not bad by any means, this wine did not have the fruit and complexity that I have come to associate with the Spirithouse (and Nuthouse) series of wine. Still Very Good but I would have been really disappointed if I had paid full price. 87-89 Points. 2010 Bunnell Family Cellars Gewürztraminer Wine O’Clock: Retail ~$18. We just bought this on our trip out to Seattle and I figured we would give it a twist with my wife’s famous chicken stir-fry. It was a fine choice, if I do say so myself. Not as overtly floral as its Alsatian counterparts, but there was enough litchi and rose petal to justify its bona fides. Very Good. 86-88 Points. 2005 Campion Pinot Noir: Retail ~$25. Since the last bottle of this was less than thrilling and given the vintage, I thought it best to move through the five (!) bottles that I had left rather quickly. This wine was noticeably better than the last, but still has a ways to go. The fruit was a little more up front and it tried to eek out some complexity for me, but alas, it is still not a world beater. Heck, it is not even a lemonade stand beater. Average to Good. 83-85 Points. 2006 Sans Permis Chardonnay La Chanson Argentee De Cuillere: Retail $40?. Once again, this wine rocked. I can’t believe how this wine continues to deliver and that we got it for a little more than $10. I rarely say this, but if this wine comes up on Last Bottle again, buy a case (I have bought two and I will get another). I really would like to know the story as to how/why these guys went out of business (maybe the price point was a bit too high, but this certainly tastes like a $30+ wine). Apparently, they also made a Pinot Noir, but I have not had it. Excellent 90-92 Points. 2009 Esterkyn Family Vineyards Napa Valley Chardonnay: Retail ???. My father-in-law had this out in the Kimchee refrigerator in the garage, and I thought I would give it a whirl mostly since I had never heard of it and the label was quite reserved (I do not endorse buying wine based on the label, but generally speaking, I have found that wines with a more conservative label tend to lean toward the old world style that I prefer). Good choice. The wine was a bit too cold initially, but as it warmed, it really started to shine–nice subtle tropical fruit with ample acidity and near impeccable balance. I really enjoyed this wine but know absolutely nothing about it. Very Good to Excellent. 89-91 Points. 2006 Fess Parker Syrah The Big Easy: Retail $39. Wow, this was a big wine. I have a few of the 2002 left in the cellar at home, but I do not remember them being this big. Tons of fruit and a bit of funk, but I am not sure if there is enough acidity here to balance out all that fruit. It also seems that it would be a bit tough to pair with anything, but it worked well watching the NCAA tournament. Good to Very Good. 85-87 Points. 2009 Thumbprint Cellars Cabernet Sauvignon Alexander Valley Winemaker’s Reserve: Retail $45 (WTSO price $18). This was another wine from my father-in-law’s cellar which he picked up from Wines Til Sold Out. I had never tried any Thumbprint, and I am not all that sure why. Well, if this wine was any indication, I will not be trying any more. Really over done with the fruit tasting more like cranberry/raspberry jam than wine. There was even a touch of sweetness that was really out of place. This is a great example of what wine geeks call “over extracted.” None of the ratings really apply here since it was not “Good” nor even “Average”. WINE OF THE WEEK: I never thought that the wine of the week would come from my father-in-law’s “cellar”. There are a few stories there, none of which I am allowed to tell. 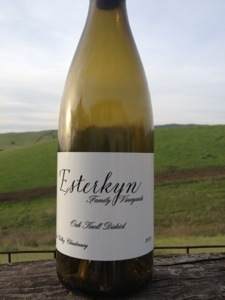 The 2009 Esterkyn Family Vineyards Napa Valley Chardonnay proved to be quite the enigma. I searched all over for info on this wine and found none. There are only two vintages (2006 & 2007) in Cellar Tracker–neither with a tasting note or pricing. There is even less information on the web–nada, zilch, zero. Where did he get this wine? Can I get any more? It was not an earth shattering wine, but it was well made, and the whole mystery aspect has me perplexed. I guess I have a bit of OCD in me and I am determined to find out more. Perhaps my father-in-law can provide some more answers. Start holding breath now…. 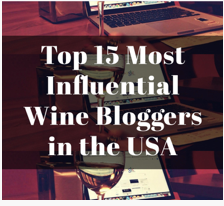 This entry was posted in Champagne, Tasting, Wine and tagged Argyle, Chardonnay, Esterkyn, PLCB, Sans Permis, Sparkling Wine, Zinfandel. Bookmark the permalink. You are far too kind! Reading your blog and the places you go, I envy you! I’m also an Argyle fan, but I’ve never tried the sparkling wine. I think I’ll get some on my next trip to the store–celebrate the arrival of spring. Oh, you certainly should! Yeah Spring (although back East it sounds like they are getting some snow…). Well, it will be interesting to hear what you think about the wine. We really like it but there has been some (slight) bottle variation, but I really like it–a bit of a cross between old world finesse and new world muscle. We paid a little over $10 since I had a $20 credit each time. Good to hear your enthusiasm for Argyle brut. Love their pinots usually but haven’t tried their bubbly. Always a place for bubbly in my heart. Thanks. Thanks for the comment! Their bubbly is good, but the retail price has been creeping up the last few years…. WOW – you went through some wine!!! I love the mysterious Esterkyn – you will have to dig out more info on it. Surely someone on Twitter can provide some input. Twitter is a good idea! My rather-in-law says he got it at BevMo! but I can’t find it on their site either. I saw that! Very nice indeed!